The staff of the Department of Neurophysiology of Mohamed-V University of Rabat Sitting (from left): Prof. Halima Belaidi, Dr. Fatiha Lahjouji, and Prof. Nazha Birouk. 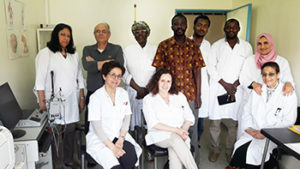 Standing (from left): Dr. Bouchra Kably, and Profs. Alassane Dravé, Youannes Debebe, Boubacar Maiga, Fatima Hassane Djibo, Reda Ouazzani, and Leila Errguig. I would like to thank the WFN for giving me the opportunity to have a fellowship in clinical neurophysiology at the University Mohamed-V in Rabat in Morocco. I would like to express my sincere gratitude to Prof. Mustapha El Alaoui Faris, the coordinator of the Rabat Center, for his advice and follow-up during my successful training. I also thank Prof. Reda Ouazzani, the head of the Department of Clinical Neurophysiology, for his warm welcome and nice teaching. I also thank the department team: Profs. Nazha Birouk, Halima Belaidi, and Leila Errguig, and Drs. Fatiha Lahjouji and Bouchra Kabli. My training took place every week, from 9 a.m. to 3 p.m., Monday through Friday. I performed all of the neurophysiological explorations under the supervision of Prof. Ouazzani. In the department, I had the same activities as the Moroccan residents in neurology and neurophysiology. Video EEG: I participated in the recording, reading, and interpretation of video EEGs for patients with epilepsy. I interpreted the EEGs alone at first, and then I discussed the EEG patterns with one of the professors in the department. EMG: Initially, I practiced EMG under the supervision of the professors. Then, I practiced EMG alone and discussed the protocol and patterns with one of the professors in the department. Evoked potential exploration: I did time-to-time evoked potentials with Dr. Kably. Neuromuscular outpatient visits: I regularly attended the outpatient consultations on neuromuscular diseases with Prof. Birouk. Epileptology: I attended the epileptology consultations with Profs. Ouazzani and Belaidi. The first six months were focused on EEG and epilepsy, and the focus in the last six months was on EMG and neuromuscular diseases. I attended the departmental conference from 2:30 to 4 p.m. on Thursdays. There, we discussed interesting EMG and EEG cases selected from Monday through Wednesday. The last Friday of every the month, we held a multidisciplinary conference in the morning involving all of the neurology departments of the hospital. An oral presentation was made by each department, and the presentation was debated. In the afternoon, we had a multidisciplinary conference that included neurologists, neurosurgeons, and neuroradiologists at the National Center of Neurosciences and Rehabilitation inside the hospital Hôpital des spécialités. Oct. 13-15, 2016: The course on Movement Disorders, organized by the Movement Disorders Society and the Moroccan Association of Movement Disorders in Marrakesh. Nov. 10-12, 2016: The Autumn Congress of the Moroccan Society of Neurology in Rabat. At the conference, I received an award for the best poster communication. March 15-18, 2017: I presented an oral communication, “Phrenic Nerve Conduction Study in Six Patients With Amyotrophic Lateral Sclerosis and Review of the Literature,” at the African Academy of Neurology Conference, in Hammamet, Tunisia. 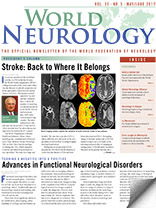 March 28-31, 2017: Les Journées de Neurologie de Langue Française, the annual French meeting of neurology, in Toulouse. April 27, 2016: I attended a course of Prof. Fabrice Bartolomei from Marseille on epilepsy and sleep. I attended two seminars for residents of anatomy and physiology of the nervous system, organized by Faculty of Medicine of Rabat. March 10-11, 2017: I attended an EMG Practical Workshop on Traumatic Nerve Injuries, animated by Prof. Emmanuel Fournier of Paris and Prof. Nazha Birouk of Rabat, in Marrakech. To enhance my knowledge on the theoretical level, I enrolled in the University Diploma on EMG and on EEG. I am satisfied with my fellowship in the Department of Neurophysiology at Rabat. Thank you for the scientific environment and the availability of the whole team of the department. I had an excellent stay in Rabat, during which I gained knowledge in both EEG and epileptology, as well as in EMG and in neuromuscular diseases. I believe I will be able to pass on the knowledge in neurophysiology that I acquired in Rabat to my colleagues in Mali and help improve the practice of neurophysiology in my country. I am planning to use EEG and EMG at the teaching hospital of Point G to support the clinical evaluation needs of patients with epilepsy. I will do an EEG evaluation of study participants in a research project on autism in Mali. I am currently designing a study on EEG biomarker identification in autistic children.